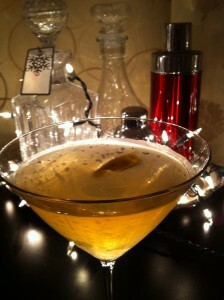 Wishing a happy and healthy 2012 to all of our friends and fellow cocktail aficionados. Named after the street where our apartment was located and made on the fly with local ingredients in our makeshift kitchen bar (two tumblers served as a cocktail shaker), this makes a light and sophisticated nightcap. Shake over ice, strain into glass and top with a generous splash of San Pellegrino Limonata. 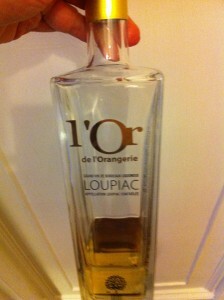 A slice of lemon rind finishes the drink. Delicious and subtle, Shaker One gives this cocktail 4 3/4 olives. 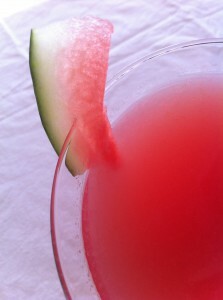 Hot weather makes Shaker One crave juicy summer fruits…..strawberries, melons, all so refreshing and juicy. One bite of the deep pink flesh of a ripe watermelon brings me back to being a kid in the summer…..sitting on the curb eating it right out of the rind, feeling the juice drip down our arms. And for some of us, trying to duck out of the way of our brother’s seed spitting skills. I’d brought home a baby watermelon with the very best of intentions. Fruit salad you shall be my dear! Until it was 6pm and 85 degrees. Somebody needed a watermelon martini. A few minutes later, with the help of my trusty immersion blender~et voila! Shake over ice, pour into glass and garnish with a bit of the lovely flesh. I promise this one won’t drip down your arm. You Put The Lime In The Watermelon? Watermelon season is in full swing and Shaker One has discovered baby seedless watermelons. 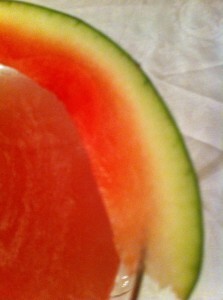 Like a personal pan pizza of melon…..sweet and ultra juicy, these babies beg to be made into a cocktail. Shake with ice, strain and slurp up faster than you can believe. Wow and yum! If you don’t have any sad abandoned lime ice pops in your freezer, simply substitute Rose’s lime juice (and up the fresh lime juice to equal the Rose’s to counteract the sweetness).